Right-Side Drawer Unit Advance Tabco BST-364 Wood Top Baker's Table with Stainless Steel Base and Drawers - 36" x 48"
What is the best way to clean and care for my wood top table? All wood products should be hand washed. If your wood top begins to show signs of wear, its finish can be restored with a food safe wood conditioner. First, clean and dry the wooden top. Then, apply the wood conditioner with a soft cloth or paper towel. Once the conditioner has soaked into the top of the table, buff off any excess with a clean cloth. Having excess conditioner on a wood top will make it feel sticky or oily. With a tiered, built-in set of stainless steel drawers and unique hardwood top, this Advance Tabco BST-364 baker's table is an essential addition to your commercial kitchen or bakery. A laminated, 1 3/4'' thick hard maple wood top serves as a practical prep surface, while a series of 4'' high coved corner risers help keep flour and other ingredients on the table at all times. In doing so, it prevents messes and allows for a more efficient and worry-free user experience as items like dough rollers or strips of parchment paper will be unable to slide off the surface and on to the floor. Each drawer in the three-tier unit measures 20'' x 20'' x 5'' to provide more than enough space to neatly store knives, molds, ingredients, date stickers, and more. Drawn insets are mounted on the bearing slides for effortless opening and closing of the drawers. Durable 18 gauge stainless steel construction ensures long-lasting use, in addition to making the table easy to clean. The table also comes with stainless steel gussets for added stability as well as 4 legs with 1 1/2'' adjustable plastic bullet feet for precise leveling on uneven floors. Perfect for a wide variety of applications, the Advance Tabco BST-364 baker's table blends an impressive design with a one-of-a-kind look. 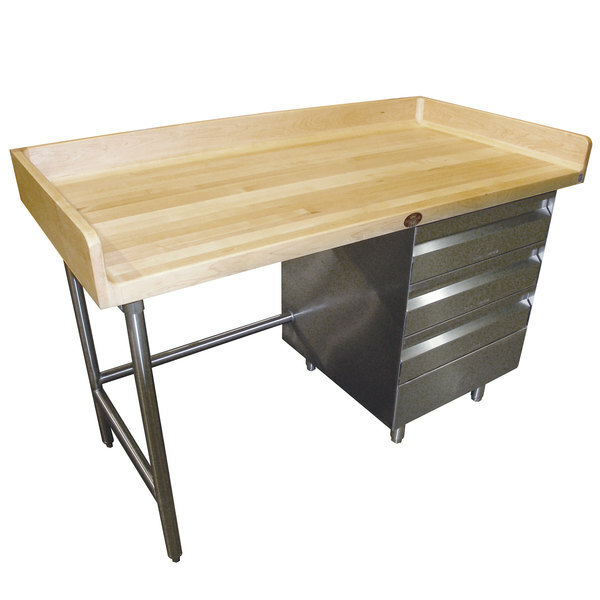 Advance Tabco BST-364 Wood Top Baker's Table with Stainless Steel Base and Drawers - 36" x 48"
Advance Tabco TBS-364 Wood Top Baker's Table with Stainless Steel Base - 36" x 48"
Advance Tabco BST-306 Wood Top Baker's Table with Stainless Steel Base and Drawers - 30" x 72"
Advance Tabco TH2G-247 Wood Top Work Table with Galvanized Base - 24" x 84"
Advance Tabco BGT-364 Wood Top Baker's Table with Galvanized Base and Drawers - 36" x 48"
Advance Tabco TH2G-245 Wood Top Work Table with Galvanized Base - 24" x 60"
Eagle Group MT2496ST Wood Top Work Table with Stainless Steel Base - 24" x 96"
Advance Tabco TH2S-364 Wood Top Work Table with Stainless Steel Base - 36" x 48"
Advance Tabco TBG-307 Wood Top Baker's Table with Galvanized Base - 30" x 84"